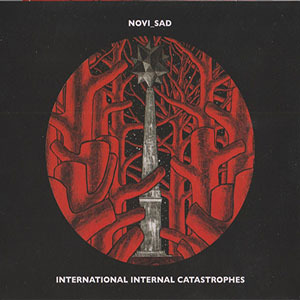 Brainwashed - Novi_sad, "International Internal Catastrophes"
The latest work by Thanasis Kaproulias, like 2016's Sirens, is the audio component of a larger, more multimedia focused piece of art. The other half, a film by Isaac Niemand, is not included this time around, however. These two distinct audio pieces are unified and based on field recordings in two very different locations, the first being the natural climate of Iceland, and the second from New York City. Even with the different sources, both pieces fit together wonderfully, with a harsher first half and a more pensive second. The first half is based on nature recordings from audible and processed inaudible phenomena. Right from the beginning Kaproulias weaves together some crackling distortion and cleaner, underlying tones into a blast of sound that occasionally teeters into gratingly harsh. The noise is shrill and panned side to side, occupying the higher frequencies and at times becoming quite unpleasant, especially at high volumes. Eventually he reigns in the static, allowing the low drone to morph into something more pleasant and melodic. By altering the frequencies and dynamics, Thanasis rearranges the work into something more inviting warm, compared to how it began at least. At around the midpoint, the piece transitions to its second half, largely constructed from recordings of bridge vibrations in New York City. Oddly enough this is, at first, a more conventionally tonal work. The sounds are processed and treated to almost resemble strings, layered and piled atop one another. Kaproulias keeps these largely calm and tonal, but soon the noise begins to creep back in. Soon he adds in a sample of a Bosnian woman mourning her children at a funeral, and unsurprisingly this heralds a change to darker, more depressing realms of sound. As the voices appear Kaproulias brings in noisier layers and passages to exacerbate the depressive turn that the piece takes. The build is gradual, but steady, and it ends up getting rather ugly overall. This is especially pronounced in the final few minutes where the noise is pushed far into the red, ending the piece at painful, deafening layers that could potentially damage playback equipment (and ears). It is a fitting conclusion that brings things around to where he started with the work. Even divorced from the visual element, International Internal Catastrophes is an exceptionally nuanced, at times painful and challenging work. Again Thanasis Kaproulias is consistently showing his developing skill and ability as a composer, attempting new approaches without becoming stagnant. I have found some of his previous works to be somewhat difficult (in a positive way), and this one is definitely up there, especially in its bleaker, more aggressive second half.